Robert earned a Bachelor of Arts in Immunology and Biochemistry from The University of Sydney in 2009. He then earned his MD from Yale School of Medicine in 2014. 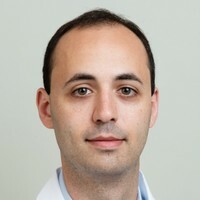 He completed his residency in internal medicine at Beth Israel Deaconess Medical Center and Pulmonary Critical Care Medicine fellowship at UCLA Medical Center. He is interested in investigating innovative predictive modeling techniques to increase diagnostic throughput, improve economic savings, reduce the burden of diagnostic testing on patients, and even potentially improve adherence to therapy in the field of sleep medicine. He is currently working with a multi-institutional sleep research group that is focused on developing a predictive model to identify the subset of patients currently being referred for home sleep apnea testing (HSAT) who will have a non-diagnostic study (i.e. normal study with AHI < 5 or technically inadequate study) with a goal of implementing the resulting model into a clinical decision tool. Nancy earned a Bachelor of Science in Molecular, Cell and Developmental Biology from the University of California, Los Angeles. She then earned her MD from the University of California, San Francisco. She completed her residency in Internal Medicine at the UCLA Medical Center and a fellowship in Pulmonary and Critical Care Medicine from UCLA David Geffen School of Medicine. She is currently working on a project at the Sleep Center at the VA Greater Los Angeles Healthcare System that will examine patterns of PAP usage among different subgroups of patients with the overall objective of developing a plan to target high-risk patients for interventions to improve PAP adherence. She has also explored a variety of research interests related to cost, quality of care, and optimization of healthcare delivery. Her long-term career goal is to develop methods that will allow for more efficient delivery of PAP adherence interventions to vulnerable patients and to ultimately reduce racial health disparities among patients with sleep disorders, especially in the veteran population. Michael earned a Bachelor of Arts in History and Literature from Harvard University with an honors thesis entitled “Latino Identity in the Literature of William Carlos Williams” in 2005. He earned his MD from the University Of Pennsylvania School Of Medicine in 2012. She completed her residency in Internal Medicine and Pediatrics at the Children’s Hospital of Philadelphia and a fellowship in Pulmonary, Allergy, and Critical Care Medicine at the University of Pennsylvania. He is interested in working with young adults with chronic lung disease who required home assisted ventilation, including the population of patients with Muscular Dystrophy and other neuromuscular disease that results in chronic hypoventilation. His long-term goal is to investigate the ways in which technology and home monitoring can be used in this population to improve both outpatient and home care, reduce preventable hospitalizations, and improve both symptom management and quality of life. He is currently working on a Master’s thesis examining acute care use, including ED visits and hospitalizations by individuals with muscular dystrophy (MD) and home ventilator support using an administrative claims data set of a large national private insurance company. Matthew earned a Bachelor of Arts in Economics from Cornell University in 2005. He then earned his MD from the University of Colorado Denver, School of Medicine in 2012. He completed his residency in Internal Medicine at New York University and a fellowship in Pulmonary, Critical Care and Sleep Medicine at the University of California, San Diego. While at NYU, he worked with Indu Ayappa and David Rapoport to study the effect of addition of forehead EEG to home sleep apnea testing, with the goal of improving accuracy of portable monitoring to diagnose obstructive sleep apnea. He is currently working on a project characterizing sleep apnea in inpatients with acutely decompensated heart failure, and in the future he hopes to study how different modes of non-invasive ventilation affect outcomes in this patient population. Vaishnavi earned a Bachelor of Science in Biology with a minor in Religion from the University of Georgia in 2008. She then earned her MD from Georgia Health Science University – Medical College of Georgia in 2012. She completed her residency in Internal Medicine at Emory University School of Medicine and a fellowship in both Pulmonary and Critical Care and Sleep Medicine at Icahn School of Medicine at Mount Sinai. She has been researching vascular inflammation and its relationship to sleep apnea. She is involved in a pilot research project with Dr. Neomi Shah investigating the feasibility of using hybrid FDG-PET/MRI imaging to study atherosclerotic plaque inflammation as a surrogate marker for atherosclerosis in a small cohort of patients with OSA, in order to (1) better understand the effect of OSA and its treatment on atherosclerosis and (2) identify more robust surrogate endpoints for atherosclerosis.